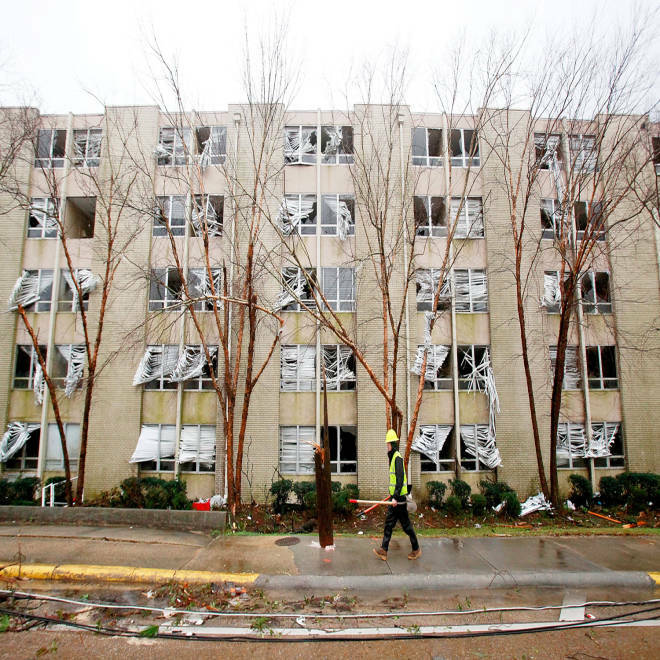 An electrical crewman walks in front of a building with blown-out windows on Hardy Street across from the University of Southern Mississippi after a tornado touched down Sunday evening in Hattiesburg, Miss. JACKSON, Miss. --Officials estimate it will take tens of millions of dollars to repair damage at the University of Southern Mississippi caused by Sunday's tornado. The College Board voted unanimously Wednesday to allow Higher Education Commissioner Hank Bounds to sign contracts and take other actions without board approval to help the 16,000-student school in Hattiesburg recover. "Because of the need to move with a real sense of urgency, we don't need to wait for a board meeting," Bounds said. His temporary authority runs through at least April. Also Wednesday, President Barack Obama signed an order declaring a federal disaster for the state. The disaster assistance can include grants for temporary housing and home repairs, low-cost loans to cover uninsured property losses and other programs to help individuals and business owners recover. Authorities say damage surveys are continuing, and more counties may be included after those are completed. Meanwhile, USM plans to resume classes Thursday, although 87 sections will be in temporary quarters. Because the school was already closed Monday and Tuesday for Mardi Gras, only one day of class was canceled. The men's basketball team hosted a game against Tulane Wednesday night at Reed Green Coliseum on the undamaged northern part of the campus. USM officials said nearly 1,000 students and other volunteers helped to clean up debris like roofing nails earlier Wednesday, filling 1,450 trash bags. Student dorms were undamaged, although some private apartments were hit. The school is offering housing to students whose off-campus quarters are uninhabitable. The tornado damaged eight or nine buildings at the southern edge of campus. One of those, a former fire station converted to house the jazz program, will have to be torn down, Bounds said. Other heavily affected buildings held music and art programs. He said officials believe the heavily damaged Alumni House can be partially salvaged. 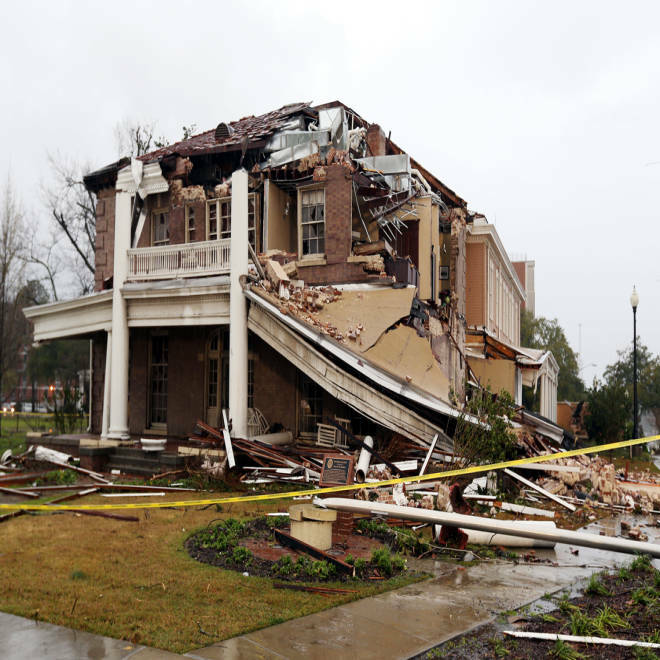 Ogletree House lies in ruins on the campus of the University of Southern Mississippi in Hattiesburg, Miss., on Monday, Feb. 11, , after a tornado struck the area Sunday afternoon. The building, built in 1912, housed the university alumni association offices. The southern end of campus, which had large live oak trees and a formal rose garden, may look a lot different, though. "Unfortunately, the beauty of the front of campus has been damaged," Bounds said. Most of the damage is expected to be covered by a $500 million insurance policy, which has a $100,000 deductible. Because the state's public universities now have what Bounds described as "really good insurance," he said he didn't immediately anticipate that USM would seek aid from the Legislature. When the Mississippi University for Women was hit by a tornado in 2002, lawmakers issued bonds to help the Columbus, Miss., school pay for damage. Besides repair and rebuilding costs, USM's insurance policy will pay an estimated $400,000 to rent and set up 16 portable classrooms in a parking lot on the northern edge of campus, Bounds said. The space squeeze will be eased by the university putting a recently renovated classroom building back into service. Tornado recovery could dominate the early part of the tenure of incoming USM President Rodney Bennett. The current University of Georgia's vice president for student affairs is supposed to start work April 1. But he drove to Hattiesburg after the storm to survey damage and remained there Wednesday. "What great pride you're showing in supporting your school by coming to help get us back where we need to be for classes," Bennett told volunteers Wednesday, according to a university news release. "This is our institution. It is going to succeed or fail based on what we do, and each of our personal commitment to its success." The tornado touched down in Lamar County's Oak Grove, a western suburb of Hattiesburg, and tracked across all of Forrest County, finally dissipating 21 miles later across the Perry County line. The tornado had maximum winds of 170 mph and a path three-quarters of a mile wide, the National Weather Service said. The Mississippi Emergency Management Agency says Sunday's storms destroyed or heavily damaged more than 800 homes in the southern part of the state. The majority of those were in Hattiesburg and Petal, with most of the rest in Lamar County.